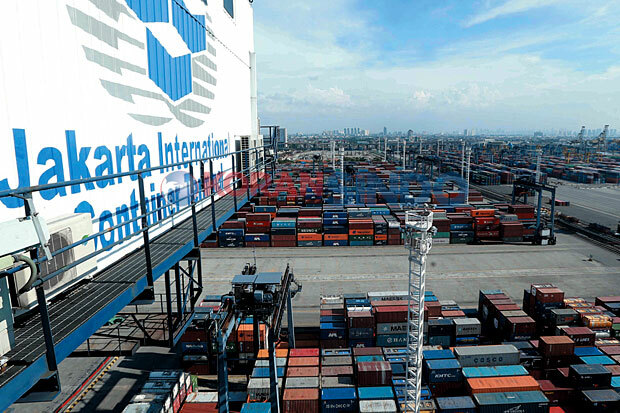 JAKARTA – Four other import export terminals at Tanjung Priok Port have been designated to get overflow or transfer of 20 vessel services due to JICT strike action which will be implemented by Jakarta International Container Terminal (JICT) union on 3-10 August 2017. President Director of PT JICT Gunta Prabawa said that the assignment of 20 ships from JICT through coordination meeting with the Tanjung Priok Port Authority office. “There are 20 vessels delegated from JICT other terminals as contingency plan if JICT workers strike occurs,” he told Bisnis on Wednesday (2/8/2017). The transfer of the ship from JICT is to the Koja container terminal as many as seven ships, New Priok Container Terminal One (NPCT-1) of six ships, Terminal 3 Tanjung Priok five ships and to Mustika Alam Lestari (MAL) Terminal two vessels. Gunta also said it had issued a second circular (SE) numbered 608/1/14 / JICT-2017 which informed that JICT services in JICT’s gate-in and billing will be discontinued on Thursday 3 August 2017 at 03.00 WIB until 15.00 WIB. In the SE it mentions the reason for termination of the service in connection with a system reconfiguration being conducted in relation to the re-arrangement of the cumulative field between PT JICT and TPK Koja requiring a system-time alignment of 12 hours. All costs that arise kating that will be borne by JICT is stacking, reefer, and recooling. “So that’s the second SE, not the first,” Gunta said. Previously, JICT manajamenen also issued a circular stating the temporary suspension of operational activities and billing services from 2 August 2017 starting at 20.00 WIB until the time limit that has not been determined. The termination of activities at JICT was delivered through a circular of the President Director of JICT Number. HM.608 / 1/13 / JICT-2017 dated 1 August 2017 addressed to service users and associates. It was taken by JICT management to respond to JICT workers strike plan on 3-10 August 2017 starting at 07.00 WIB. SE President Director of JICT mentioned that JICT Billing service is closed from 2 August 2017 at 22.00 WIB until further notice. The service at JICT gate will be closed starting at 23.00 WIB until further notice. Adil Karim, Jakarta Secretary of the Indonesian Adat Logistics and Forwarders Association (ALFI), said that the new entrepreneurs only heard of a contingency plan on the impact of JICT strikes related to loading and unloading of vessels. He says that what needs to be addressed is how engineering is for receiving and delivery services. Because the containers already existed at the port before the strike action. “What if the owner of the goods want to take the goods / kontener it.We do not see delivery efforts to containers that have been already inside and have been dismantled from the previous ships at JICT,” he said. Meanwhile, the JICT Workers Union said it would continue its strike action from Thursday 3 July 2017 at 07.00 am. SPJICT Secretary General Mokhammad Firmansyah Sukardiman said for the sake of illegal lease contract renewal, JICT directors are deliberately harming customers and sacrificing workers. He said the extension of JICT’s contract was declared by BPK to violate the Act, but was forcibly executed by JICT directors. The JICT contract renewal fee of US $ 85 million per year is paid without legal basis to Pelindo II since 2015. “Illegal rent payments have an impact on the reduction of employees’ rights as stated in the company’s rules and Collective Work Agreement (PKB),” said Firman through SP JICT Press Release on Wednesday (2/8/2017). However, he said, several times the directors wanprestasi against the minutes of meeting the fulfillment of workers right that is in accordance with the rules of the company. Firman said related to that matter, SPJICT delivered three statements of his attitude. Firstly, on behalf of the illegal lease of JICT extension, the Board of Directors is desperate to straddle the law in Indonesia, harass the rights of employees despite being listed in the rules and CLAs and sacrifice service users with the estimated loss amounts to hundreds of billions of rupiah due to the impact of strikes resulting from the default of the directors. Second, directors prefer illegal rental fees rather than employees and service users. Proven unilaterally, the directors have preceded the workers’ strike by closing JICT since Wednesday (02/08/2017). However, in a matter of hours, the directors revise the closing of JICT starting on Thursday (3/8/2017). In addition, directors condition replacement operators, divert ships and other efforts so that the opportunity losses incurred are even greater than resolving the rights of workers, all of which are in accordance with the rules of the company rather than asking for additions such as those that have been deliberately released to the public To libel employees. Third, JICT’s average revenue reaches Rp3.5 trillion per year. In 2016, employee costs fell 13% but overhead costs including directors and commissioners rose 18%. By slandering the salaries of large JICT workers, there are those who seem to deliberately want to politicize workers and give the impression that the only big salaries are JICT directors and commissioners. “For that we will fight against the systematic efforts of directors and other parties to destroy JICT’s workers and rescue movement of national assets,” said Firman.